Location - Twenty minutes by car south-west of Salta. Quality - Clean and comfortable - Given the cost the room could have been better. There was a lack of natural light which gave it a slightly dingy feeling. Service - Very friendly and helpful - almost everyone spoke English. Highlight - The beautiful grounds and the very friendly staff. Bedding and bathrooms - The sheets were crisp and clean and while nothing to get excited about the bathroom was perfectly acceptable. Would I recommend this hotel - Yes. 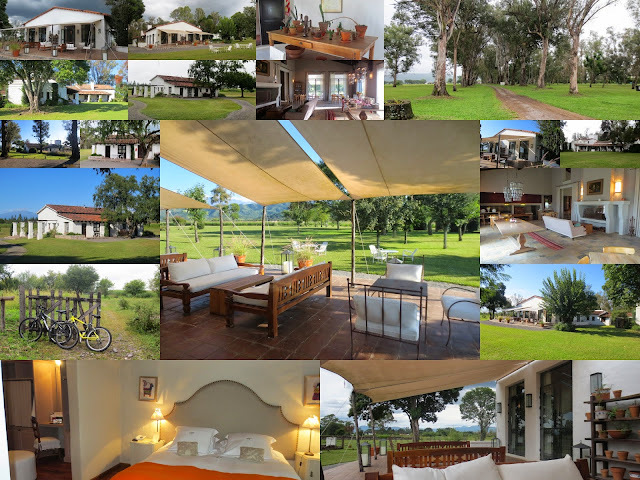 Many of Argentina's magnificent Estancias have in the past few decades been converted to resorts with a focus on horse riding where the guests can immerse themselves in Sth American gaucho (cowboy) culture. We have stayed at an Estancia once before in Uruguay but never in Argentina and we didn't want to leave without experiencing this very Argentinian way of holidaying. However David is allergic to horses and finding an Estancia which isn't all about horses was something of a challenge. While you can still ride horses at the House of Jasmines the focus is more luxury resort than just mucking about with equines. The Estancia, the closest English translation of which is probably 'Ranch', is set in a fertile valley close to Salta at the foothills of the Andes. There are enough private acres (100 hectares) that visitors can wander happily for hours without ever leaving the grounds. The main house has endless little rooms and corners, many with open fires, where we were able to curl up happily with books and laptops. A highlight was the huge double sided open fire-place in the dining room. Even in the fairly average weather we experienced while there the house was warm and welcoming. We stayed in a suite in a separate building. It was nice enough and very private but had none of the charm of the main house, which we were told was once owned by Robert Duvall. The staff rattled off the names of celebrities including Brad Pitt and Richard Gere who were among Mr Duvall's the visitors. The Estancia's private setting, imposing security gates and long driveway no doubt made it ideal for holidaying away from the prying lenses of the local paparazzi. The present owners are French which no doubt explains the rather odd name. I guess something got lost in the translation. Odd name or not however, this Relais and Chateaux property is very much aimed at the luxury end of the market.